If the ‘EN’ pin of below mux is ‘1’, there’s a always a new data entering the register bank and eventually reaching dout[0:7]. But, when ‘EN’ pin is ‘0’, the registers and mux are doing nothing, but reloading the same data again and again at every clock cycle. This will result in immense power consumption every time same data in is loaded to data out and back to data in. There is no real value is wasting so much power for doing nothing. Would like to drain your mobile phone battery for no reason? 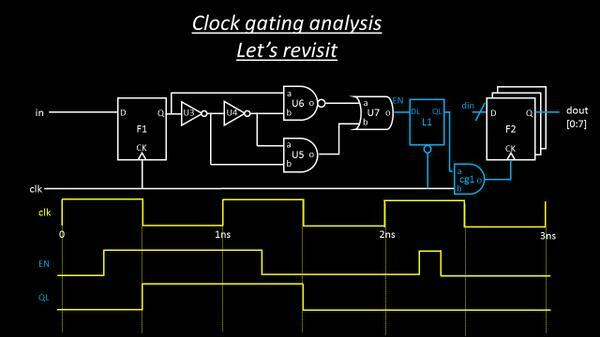 Now here, I am putting an AND gate in capture clock path to register bank, that will open only when one of its input receives a ‘logic 1’ OR when ‘EN’ is high. There’s a catch in above ‘EN’ signal. 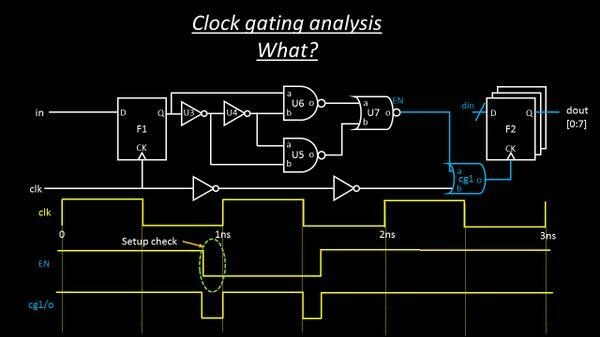 It can’t arrive anywhere in between the logic high or logic low level of clock signal, but, it needs to meet certain criteria, like if ‘EN’ goes high, it needs to go high before certain time of rising clock edge (resulting to setup-time check) and needs to remain high for the entire clock cycle ‘high’ (resulting in hold time check). 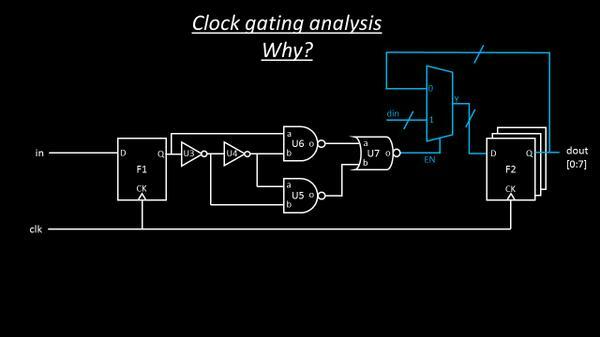 This technique of using an ‘AND’ gate is referred to as ‘Active high’ clock gating technique. Can you figure out why? 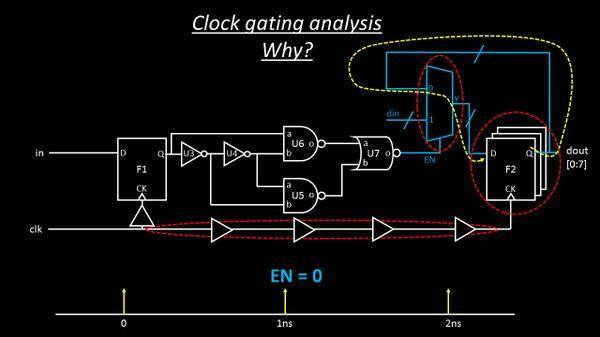 Because a high on ‘EN’ signal allows the clock cycle to hit register bank, thus allowing new data in to be loaded to data out. If still not able to figure out, no worries, I have explained this in detail in STA-2 course, for which below is the link.